Way. After leaving town at 09.15 we made our way to Gougane Barra, where we had coffee and left a car with our change of clothes. We then continued to Kealkill to begin our walk. As it was Pilgrim Path week the car park was full so we had to park in the village. We started at Carriganass ( Rock of the waterfall ) Castle. This castle was an outpost of Donal Cam O’Sullivan Beare. After the battle of Kinsale in 1602, having lost control of his strongholds in Dunboy and Dursey. He led his band of 1000 followers past this castle in mid winter, on a tragic journey to Leitrim. Attacked by both Irish and English on the way only 35 arrived in Leitrim 14 days later. We continued up the road past the castle climbing all the way. After after a little Bantry Bay can be seen. Two and a half kilometers later we leave the road crossing a stile on our left, climbing steeply towards Knockbreteen hill. The path is very well way marked. The views are fantastic Bantry Bay to the south. Cnoc Baoi to the north, Sugarloaf and Hungry Hill to the west. There is a few kilometers of road walking on this walk. 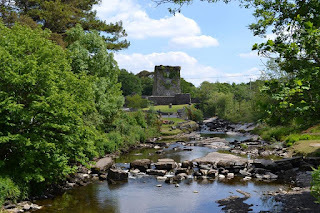 When we reached a bridge crossing the Owenbeg river, which is the half way mark, we stopped for refreshments. Here there is seating and it was a lovely place to relax. Following the markers we reached a lane way by a farm house, from here it’s a steep hard slog to the top of the never ending hill. 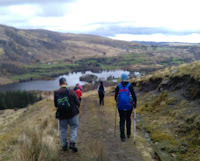 Finally cresting the hill there are spectacular views over Saint Finbarr’s shrine and Gougane Barra lake. Ground conditions were extremely wet and boggy after all the rain. Carefully making our way down hill we eventually arrived at the car park. We had hoped to change our clothes in Ireland’s top loo. ( According to The Lonely Planet ) .Only to find them locked and bolted. It even has a plaque on the wall saying Ireland’s Top Loo. We had to make do with the car. We had no sooner changed when it began to pour rain, we were very lucky that the weather held up for the walk. We went to the hotel where we had soup , sandwiches, coffe tea etc. 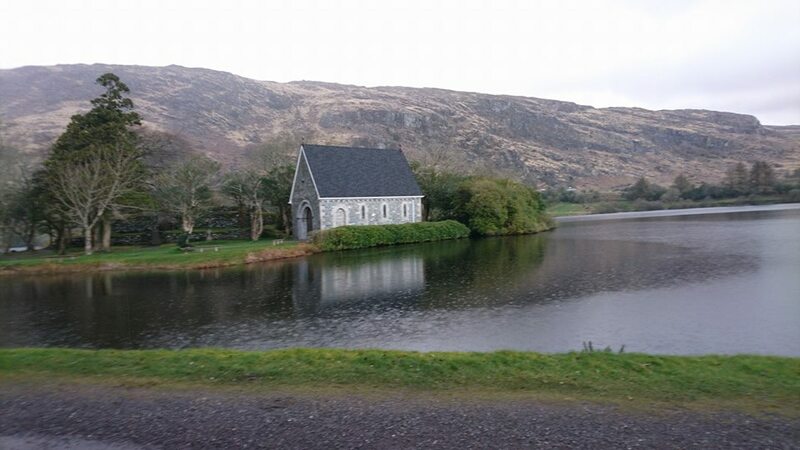 Gougane Barra is the burial place of Tim Buckley and his wife Anastasia, better known as the Taylor and Ansty from the book by Eric Cross published in 1942. The book was banned by the Censorship Board after a three day long debate in the Senate.Where some politicians made asses of themselves. What’s new.?? 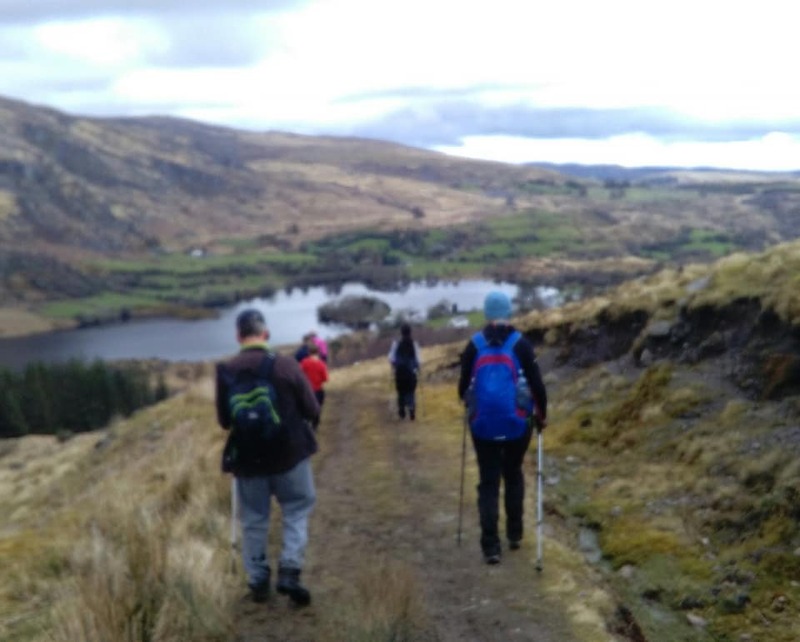 Some days later three local priests arrived at the Taylors home in Garrynapeaka near Gougane Barra and forced the 79 year old Taylor to burn his copy of the book in his fire place.The Taliban were alive and well then also......I know it has nothing to do with walking.